Although more than 80 years have passed, the bloom hasn’t left Rose Cottage. 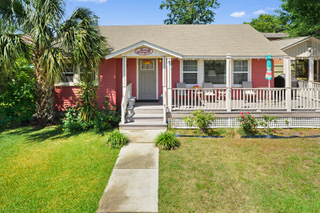 Located in Bay St. Louis’ historic district, the popular vacation rental attracts 40 to 60 guests each year, promising comfort and convenience. “It is popular among tourists, travelers and snow birds who want to get out of the colder, northern parts of the country,” says Joey Manieri of Manieri Real Estate, which has been managing the property since 2013. Visitors come from throughout the United States, he adds, and as far afield as Canada and Europe. Since it was built in 1935, the cottage largely has been owned by one family, according to current owner Ann Hager. When the family’s plans changed, she bought the property in 2012 and completed extensive renovations before welcoming renters the following year. The 1,100-square-foot cottage can sleep six people, with two bedrooms and two futons as well as a kitchen, living room, dining room and utility room. Despite the property’s quaint qualities, guests don’t sacrifice any modern luxuries, such as a washer and dryer, cable, wireless Internet, a coffee maker and cooking utensils. “The deck is convenient for barbecues,” Hager adds. 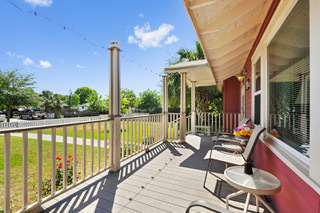 “The carport affords a great covered place to play or entertain.” Boat owners will appreciate a second gate in the front fence that allows parking access. 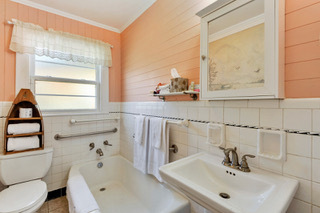 Perhaps most importantly, the cottage is within easy walking distance to the beach, harbor, restaurants, and shopping. Bicycles and golf carts also are available to rent. 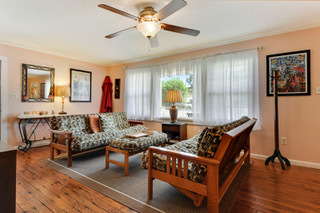 “The aspects that guests enjoy the most, as stated in the guest VRBO reviews, are location, homey atmosphere, convenience, comfort, cleanliness, porches, pet friendliness and, yes, management,” Manieri says. Visitors stay anywhere from two nights to two weeks, he adds, but some have remained as long as three months in the winter. Many reviewers said they look forward to a return visit. YOU are Gulf Coast Woman! GCW is your magazine. It’s all about the things you love, sharing your life, learning from each other and celebrating together. Pick up a magazine every other month at coffee shops and other high-traffic places, read us here or follow us on social media. © 2018 Gulf Coast Woman Magazine.